Rakul has multiple films releasing in Tamil, Hindi, and Telugu. The actor opens up about her role in ‘Dev’ and working with Karthi, in a chat with TNM. Rakul Preet, who was last seen in H Vinoth’s Theeran Adhigaaram Ondru, is back in Tamil cinema after more than a year. Her upcoming romantic drama, Dev, unites her once again with Karthi, who played the lead role in her most recent Tamil film, and this time, the duo hit it off instantly. “It helps a lot when you share a good rapport with your co-star. Karthi is a thorough professional and it was a pleasure working with him once again,” Rakul says. Incidentally, it was Karthi himself who wanted her to listen to the script of Dev, when Rajath Ravishankar had approached him. The actor says that Dev is quite a progressive film, in terms of how it portrays relationships. Apart from the character graph of her character and Karthi’s, Rakul is all praise for Rajath’s perspective in depicting father-son, mother-daughter relationships in a modern way. “The film celebrates love in various forms. Whether it’s between Meghana and Dev, or within the family, the relationships are quite progressive. What I really liked about Rajath’s script is that it normalises working women and doesn’t portray them to be too greedy or selfish. This is the kind of film where the woman's mother asks her to find love because the daughter is leading a boring life. Nuances like these are quite relevant in today’s time and age,” Rakul adds. The film also focuses on the emotional upheavals in the lives of its protagonists, where Dev is adventurous and loves nature, but Meghana has no time for anything apart from her work. “Sometimes, the scenes which Rajath had written felt so real that I even asked him if it’s inspired from his own life because it’s really tough to write such stuff unless you’ve experienced or seen it in real life," she says. Her enthusiasm while talking about the film and her role, in particular, is quite palpable. For instance, she says, there were quite a times during the shoot where she would get angry with some of the things that Meghana does in the film. But each time, Rajath would convince her to look at the situation from Meghana’s perspective. The most memorable part of Dev’s shoot for her was the filming of the song, 'Oru Nooru Murai', which was shot in the Western Ghats. “We shot for it near Lonavala, Khandala, Panchgani and other places. It was almost like going for a trek and camping at each place. It might sound like a vacation, but imagine waking up at 4:30 every morning because we had to capture the sunrise. We would barely sleep for four hours, but it was totally worth the effort,” Rakul laughs. With Dev slated for release later this month, the actor has barely any time to take a break. She’s been shooting for her next Hindi film Marjaavaan in and around Mumbai, and another film, De De Pyaar De, is releasing in April. In Tamil, she still has quite a lot of stuff left to shoot Ravikumar’s sci-fi film where she’s paired with Sivakarthikeyan. And then, there’s Suriya’s NGK, directed by Selvaraghavan, which will hit the screens in April this year. “Now that I’ve worked with both Karthi and Suriya, I must admit that I’m amazed by how humble and grounded both of them are. They are very different people, but they share a lot of common values. It’s quite inspiring,” she says. Before she wraps up the conversation, the actor says that she is still coming to terms with the buzz that she hasn’t been focusing on Telugu cinema for a while now. “It was overwhelming in the beginning. To be frank, I did four films last year, and I don’t think I could have added more to my work schedule. 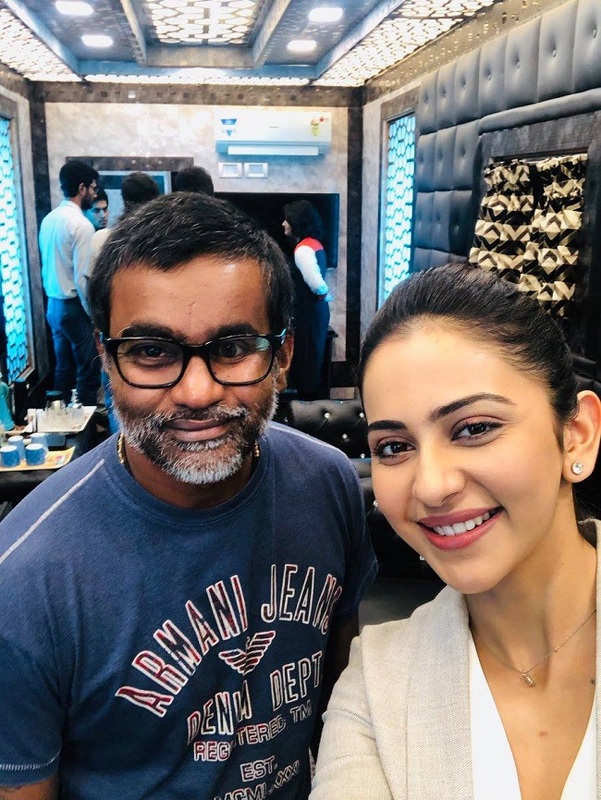 But this year, I’ll finally begin shooting for Venky Mama, and I can’t wait for it to release,” Rakul signs off.